For My Favorite Photos in a Collage - Hair challenge. Odd that a lot of my selfies revolve around hair! LOL! But, he's on of my all-time favorites of my youngest son when he was 4, my daughter (miss hair, herself) and the little girl I did a photoshoot with a few years ago. What a bright and vibrant collage! That red hair spike really makes this pop! This is quite a collage. so much to look at. @olivetreeann No, it was on purpose. LOL! He wore his hair like this for 2 years (age 4-6) before he got tired of it. It matched his wrestling uniform. He has 8 cowlicks around the top of his head, so his hair naturally grows into this faux hawk. 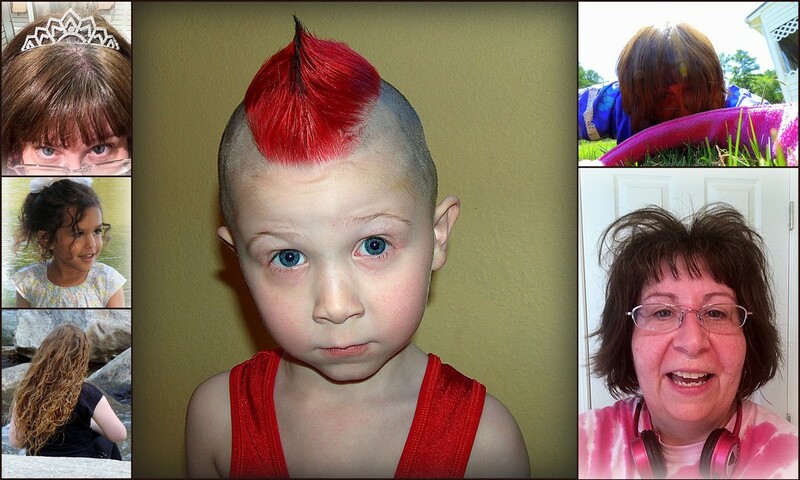 Love the mohawk, especially after reading your story about it.